Local First | Celebrate the Bounty! We’re COLLECTIVELY behind any campaign celebrating the Beehive State’s bodacious bounty, and we're pleased as punch that the fine folks over at the Local First Utah have made it their priority since 2006. Supporting locally-owned businesses, artisans, farms, creators, and independent operators, Local First Utah provides tools and resources to keep Utah businesses thriving. They also create buzz to get consumers out of big box stores and into independent shops, making the choice to “Buy Local First” an attractive economic and social imperative. Now that’s a damn fine message. 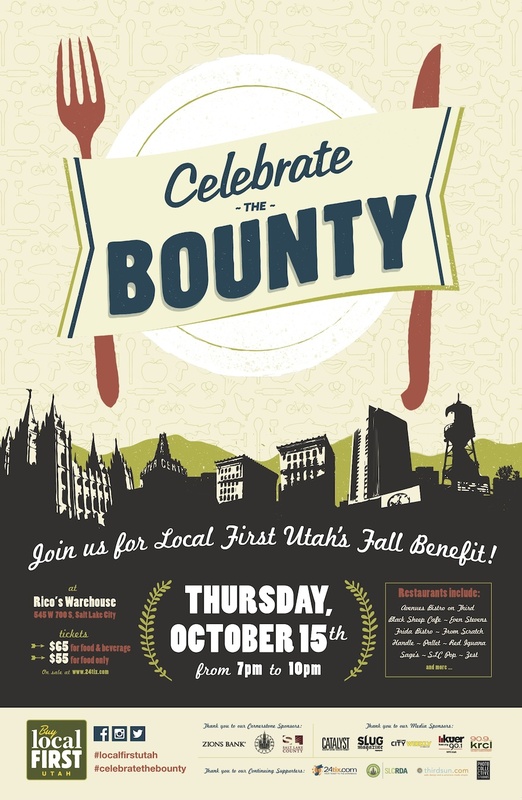 Local First's annual fundraiser Celebrate the Bounty is coming up October 15th at the rustic Rico’s Warehouse, and the fete will feature nosh from some of our fave local food talents: Avenues Bistro, Frida Bistro, From Scratch, Handle Park City, Pallet, Red Iguana, SLC Pop, and Zest, among a few fabulous others. Dranks will be flowing from the glorious shaker of Bar-X boozeman Jake Hall, vino from IG Winery, and Wasatch Brewery’s got the beer options covered. Sips 'n' eats: handled. Your tickets? Go get 'em.